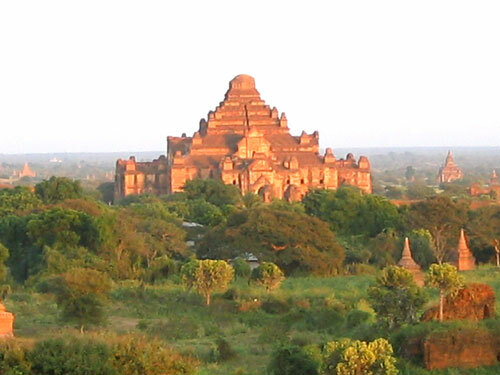 Bagan is situated in the hot and dry zone, 100 m above sea level. The place is known as the birthplace of Theravada Buddhism. More than 2,000 temples and stupas, built in the era between 11th and 13th Centuries, still exist today as national Heritage on the banks of the Ayeyarwady river. Architectural features of vaults and arches, sculptures and mural paintings can be observed in Bagan Pagodas. The use of form and space in building these Pagodas, structural concepts and lighting giving are unique. It is impossible to see all the Pagodas and therefore it is necessary to select a few outstanding Pagodas to see those in detail. Highlights are Ananda Temple, Manuha, Nanphaya, Wet Gyi In Gu Pyauk Gyi, Shwezigone Stupa, Mingalar Zedi, Damayangyi Temple, Sulamani Temple and Damarazika Stupa. 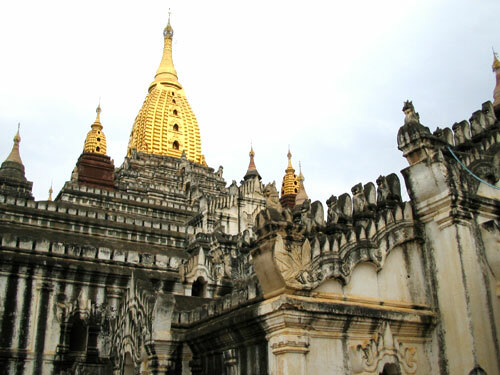 Shwe San Daw, Bupaya, Lawkananda and Mingalar Stupas are famous for good sunset views. Recently a tower was built in Bagan. 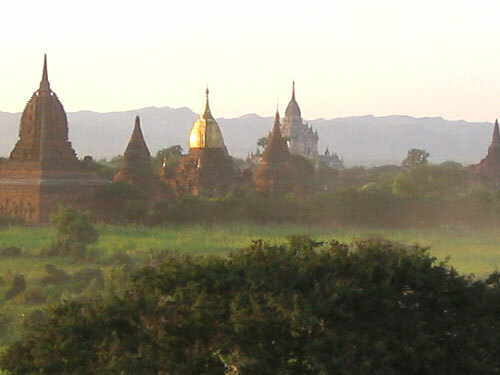 From here one can enjoy the sunset over Bagan against a high entrance fee. Since then it is not anymore allowed to climb on many Pagodas, presently many Stupas in Old Bagan, e.g. the Shwe San Daw Pagoda, are open. 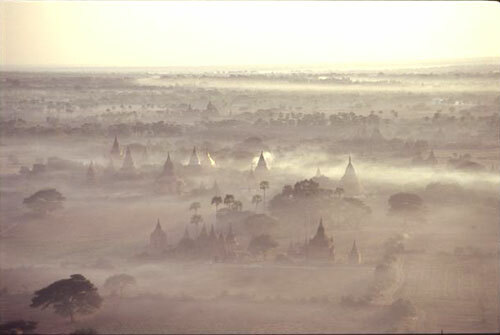 It is recommendable to visit Bagan during the cool season. If one wants to visit during the hot season (March to May), prepare for early morning sightseeing and taking a rest during noon. Wet-Gyi-In Gu-Pyauk-Gyi Pagoda displays fine mural paintings. Was built in the 11th Century and is one of the most artistic temples in Bagan in the earliest and finest Bagan architectural style. The huge teak doors inside are from the 15th Century. Inside the temple with the Buddha Images, a unique way of providing natural light can be observed. You will see different hand postures and a great carving technique for the Images. You may enjoy an early morning trip with a hot-air balloon to see the plains with all the Pagodas and the Ayeyarwady offered by a long established and professional UK operator. This service does not come cheap but is an unforgettable experience. Very often, the flights are fully booked, therefore a pre booking ahead would be wise. Lacquerware workshops and craftsmen are mostly located in Myinkabar village. You can see all processes of making lacquerware from the start to the end. Basic materials used in making lacquerware are bamboo strips and lacquer. Finer and softer lacquers are made from the hair of horsetails. Lacquerware quality in Bagan is quite famous, there is however also a lot of cheap quality produced. Lacquerware can also be bought in Yangon at reasonable prices. Toddy palms are the symbol of central Myanmar and can grow only in the hot and dry zone. Toddy palms are one of the most valuable plants for people from central Myanmar. Leaves are used for thatched roofs. Toddy bark can be woven into many utensils (e.g. baskets, mats, hats and chairs). In addition, sweet and bitter toddy juice can be extracted from the buds. Sweet toddy juice is used in making snacks, when fermented, bitter juice is drunk as an intoxicating "wine".